It was such a pleasure to document the beautiful wedding of Amanda and Clayton. We started the day with the couple at the wonderful Keswick Hall to document their getting ready. We then traveled to the beautiful Cathedral of the Sacred Heart in downtown Richmond, VA. Amanda had planned so many amazing details and events that made their day extremely special. 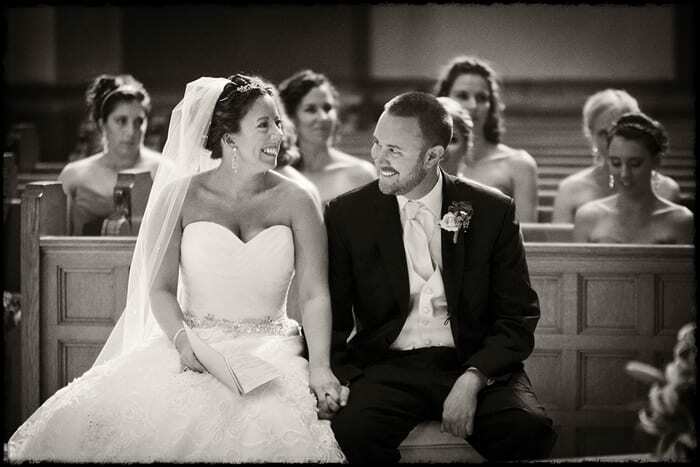 However, to me, the emotion captured in this photograph is the perfect reminder of this couple and their wedding. Throughout the day, it was obvious to see the love these two shared. From the way they treated each other to the way they looked at one another, it was no surprise that Amanda and Clayton were meant to get married. During the ceremony, the priest had cleverly inserted a joke into his sermon, and Amanda immediately started laughing. At that moment, I noticed how enamored Clayton looked with his bride and I took a few images. I love this image, not only because of the emotion captured in both Amanda and Clayton, but also because of all of their closest friends seated behind them. The lighting is dramatic, and I love the multiple layers of bridesmaids along with the tender holding of hands in the foreground. Moments like these are what keep me coming back to each wedding with a strong desire to capture the emotions of the day as they unfold.